Personality: Chantry is sweet and kind, but she has a dark, distrusting side, especially of humans and of the Church. She seems like a lost soul. She recently lost her twin sister and consequently feels empty inside and is looking for something or someone to fill that emptiness. Clan: Was a two-gargoyle clan in France, now Manhattan. 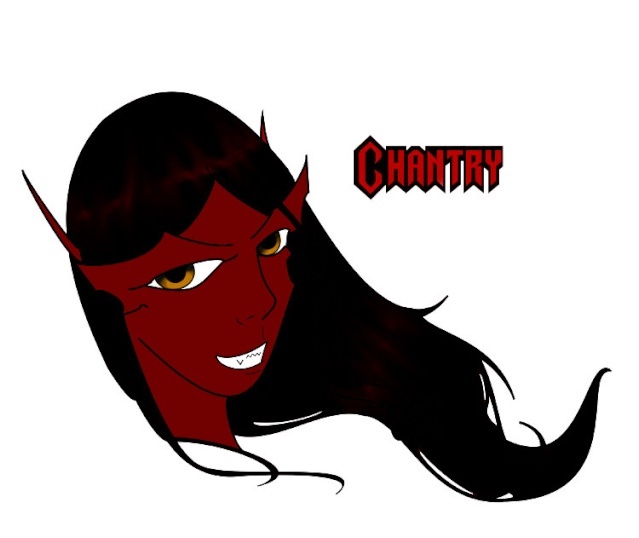 Description: Chantry is a deep, devilish red colour, with mid-length black hair. She has very broad horns over her eyes, more like a brow-plate. Her wings are large and bat-like, with a very deep red membrane, nearly black. Her wings have large, three fingered hands on them. She has spikes down her back, along her tail, on her elbows and knees, and a spade on the tip of her tail. She looks like a demon or devil, which made living in a small church very confusing. Her left hand is missing her middle finger, and her arm is cracked. History: Two eggs were protected by a priest in a small convent in France. The eggs hatched minutes apart from each other. Chantry looked the devil while her sister, with feathery wings, looked the Angel. They grew together, living in secret inside the convent. Word got out that perhaps the priests were abusing some of the children and the citizens, enraged, attacked the church, setting it aflame and smashing statues. Chantry and her sister slept their stone sleep hand in hand, and her sister was the first to be smashed. Chantry awoke just as she saw her sister crumble, her own fingers smashed and cracked. She managed to escape the chaos, to fly away, scared, disfigured, and alone.